This post is unlike any I’ve done before because it doesn’t involve a bike ride. Although it veers from the stated goal of the blog, it is related. This post consists of the first part of an interview I did in January 2014 with Donald Empson and his wife, Kathy Vadnais. They are the authors of the book “The Street Where You Live: A Guide to the Place Names of St. Paul”, one of my primary research resources. 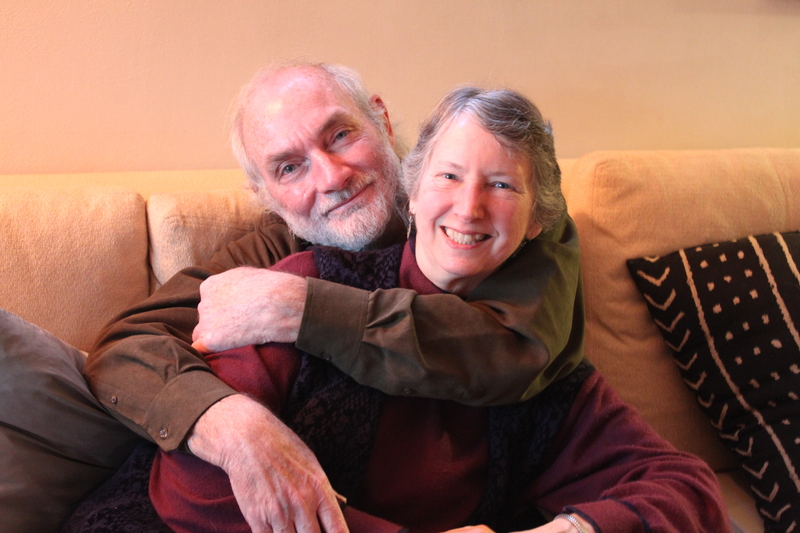 A sincere thanks to Don and Kathy for their time and support of my project. This interview has been edited for clarity. Q: How did you get interested in the street names in Saint Paul? Q: This was in the 1970s? Q: What did you do at the Historical Society? Q: What kinds of maps were these? Q: How did the first edition of the book do? Q: How did you market the book? Q: Skipping ahead to the mid-2000s when you redid “The Street Where You Live.” Why did you do a second edition? Q: Any idea how many copies you sold? Q: What did you add to this addition that made it bigger (than the original)? Q: How was the route of I-94 finally selected? Q: Your wife, Kathy Vadnais, contributed to the second edition of “The Street Where You Live”. Tell me about her involvement. Q: Did you walk or drive every street? D.E. : “We tried to find people who knew the area like Karen Swenson, who’d been an organizer on the East Side for years took us around and showed us all the different places. She showed us places we never would have found by ourselves. Then we had a woman out in Highwood who lived out there who took us around and showed us the sights, introduced us to people and we got into houses. Q: Why do you find the East side so interesting? D.E. : “When you look at the old atlases you can see there were a lot of lakes in there. What they would do is get the city to put the street in and they would fill in a little bit along the street and they left the whole drainage area in the middle because the value of the property wasn’t worth filling it all in. So what you get on the East side are these great big blocks with these terribly big lots but only about the first third of the lot is actually useable. The rest is just a lake bed. 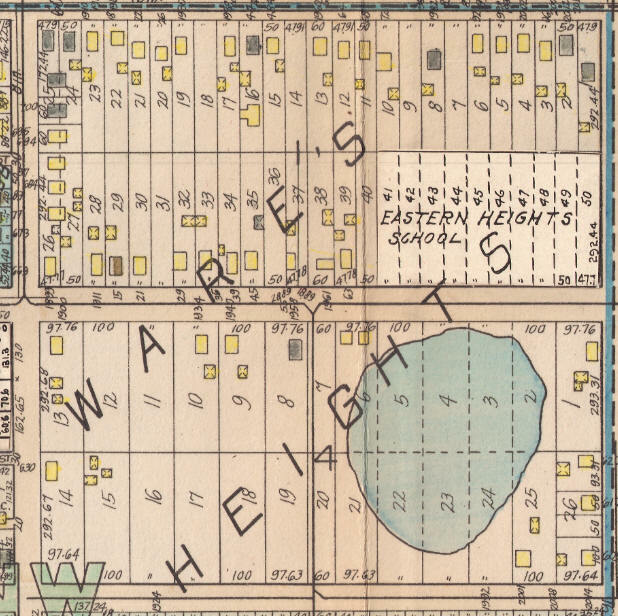 The 1928 Hopkins Atlas showing the lake south of Eastern Heights School. The block is between Margaret Street, Ruth Street, Hazel Street, and East 5th Street. 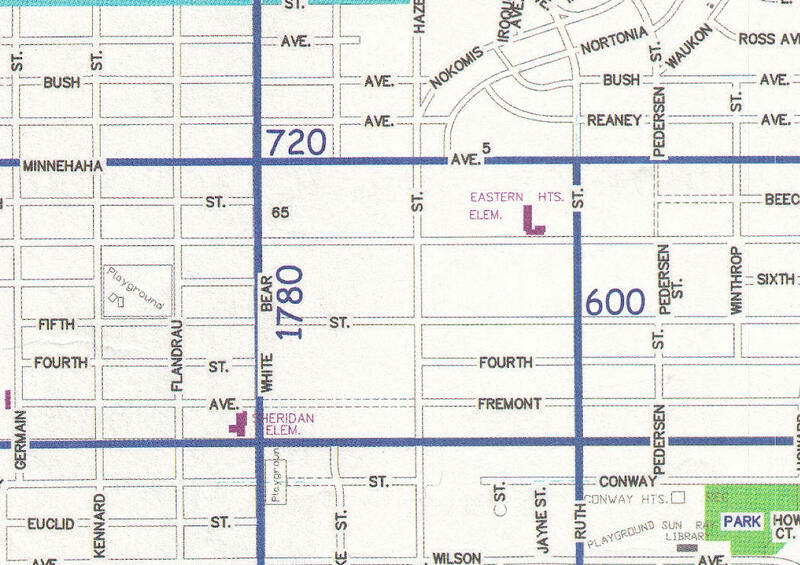 The 2004 City map shows the surrounding area. You can see these couple of blocks, where the lake was prior to being filled, are platted into much larger blocks. Lots are 300′ deep x 100′ wide. This City of Saint Paul map shows the placement of houses on the lots. The street was built through the former lake bed, and then the area next to the street was filled in for the houses. Notice how they all are close to the street. The bigger lots are 100 feet wide by 300 feet deep. The curving roads of Beaver Lake Heights are obvious in this section of the 1916 G. M. Hopkins map of Saint Paul. Q: Are you a Saint Paul native? Q: You moved to the West End neighborhood in the 70s but you say the 90s were an interesting time there. Explain what you mean. Q: Tell me more about discovering the origins of Saint Paul’s street names. The second part of this interview will be posted in the near future. Please visit www.SaintPaulByBike.wordpress.com for other posts. So interesting! Love the I-94 history and the random name tales. I’ve always wondered about those big blocks on the east side!